Will their new album make you wish they�d stayed in hell? 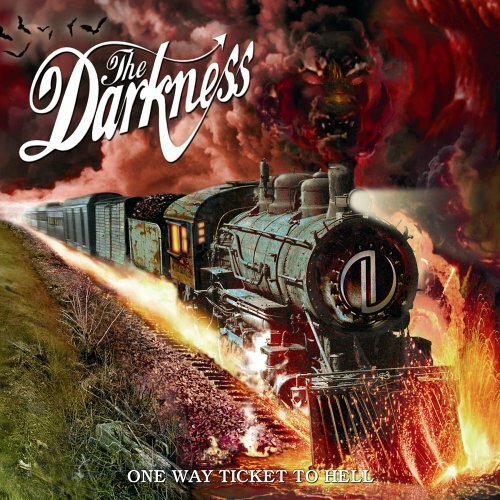 There are two things you instantly notice when you first listen to this album: The first thing is that it�s not as good as the Darkness�s previous album. The other is that there is a LOT less swearing. And by a lot less, I mean there are only about two swearwords in the whole album, which are hardly noticeable. But this doesn�t mean there aren�t any good tracks on it, and it doesn�t mean that very few swearwords make this worse than Permission to Land. Actually it�s the tunes themselves which makes this album slightly inferior to the previous version. You see, while most of the tracks are pretty good, none of them really stick in your head, and even if you here the best song on the album- �One Way Ticket�- doesn�t make you think �I want that album now� the way �I Believe in a thing called Love� did. Another thing is that none of the tunes will really stick in your head. Some of the tunes you won�t be able to remember if you try, for the others you�ll only be able to recall snippets of the track, of course, it gets easier the more you listen to it, but the sign of a really good song is that you remember it after just one play. Now, that aside, One way Ticket to Hell and Back and Permission to Land both have very different styles to them. Whereas in Permission to Land it�s a very heavy style of rock, and a lot of high pitched screaming from Justin Hawkins, One way Ticket to Hell and Back is not so heavy, and overall it�s at a lower pitch. Of course, because of the difference of the albums sounds your preferred style will affect which of the albums you like the best. So all in all this is a pretty good album but it�s not quite as good as the last one, I still recommend you get it though, and you never know, you may prefer it to Permision to Land.